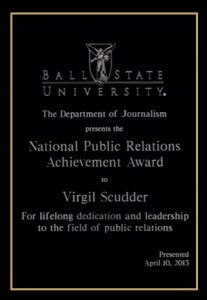 Virgil Scudder was presented the prestigious 2013 National Public Relations Achievement Award in a ceremony at Ball State University in Muncie, Indiana, on April 10. The award is given for lifetime contributions to the public relations profession and leadership in the education of the next generation of PR professionals. Previous winners include some of the most honored names in the public relations field such as Burson-Marsteller co-founder Harold Burson, Edward Bernays, considered the father of modern public relations, publisher Denny Griswold, Chet Burger, John Graham, Dan and Richard Edelman, and Larry Foster. Each year’s winner is chosen by the Ball State public relations faculty. The university has one of the largest and most respected public relations departments in the nation.